This is a distinctive deciduous species of tree that is found from southwestern British Columbia south to Baja California. Broadleaf tree, 6-30 m tall, often with many stems from the base and more shrublike; young bark chartreuse and smooth, aging to deep brownish-red and peeling off. 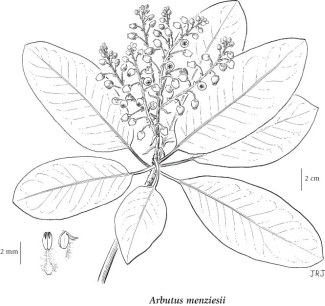 Alternate, evergreen, leathery, egg-shaped to elliptic, glabrous, entire on mature older growth, fine-toothed on young shoots, 5-15 cm long, dark shiny green above, whitish-green below. In large drooping terminal clusters; corollas white or pinkish, urn-shaped, 6-8 mm long, fragrant. Berries, globe-shaped, orange to red, about 1 cm across; surface finely granular. Dry open forests and rocky slopes on coarse or shallow soils in the lowland and montane zones; common in extreme SW BC; S to Baja CA. 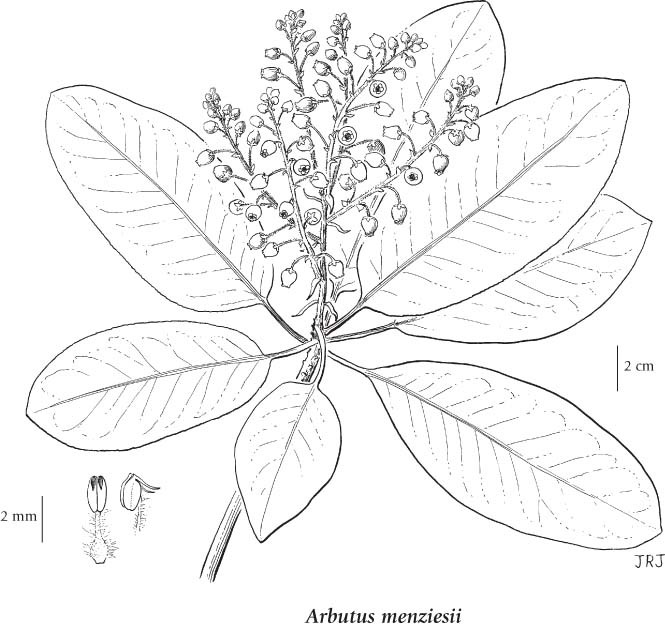 A shade-intolerant, submontane to montane, Western North American evergreen broad­leaved tree distributed more in the Pacific than the Cordilleran region. Occurs in maritime summer-dry cool mesothermal climates on very dry to moderately dry soils. Restricted to water-shedding sites on southeastern Vancouver Island, Gulf Islands, and adjacent coastal mainland; its occurrence decreases with increasing latitude, elevation and continentality. Occasional in pure or mixed-species young-seral stands (usually with Garry oak or Douglas-fir) on strongly drained sites. Commonly associated with Gaultheria shallon. Characteristic of moisture-deficient sites.